The aims of this study were: (1) to calculate measles vaccination coverage and characterize its determinants, and (2) to qualitatively explore factors associated with reasons associated with not immunization a child. In this study, the measles immunization coverage was 71.3%. The main reasons for not using the immunization services were lack of knowledge about immunization, no faith on immunization, fear of side effects and place of the service is too far. Age of mother, awareness about measles immunization, ante natal care service utilization and health facility availability were the factors that significantly associated with measles immunization. The findings of this study revealed that the coverage of measles immunization is low. Therefore health education on measles should be given for community and mothers and other additional measures should be done. Measles is one of the leading causes for child morbidity and mortality in the world, every year around 100,000 of children lost their life due to the disease [1, 2]. In developed countries immunization coverage is a good level but in developing countries, particularly in Sub-Saharan region vaccination coverage is very low [3–6]. Demographic health survey data shows in low and middle income countries that only 50% of the population vaccinated for measles and measles outbreak evidenced in these countries during 2016; 4395, 1500, and 162 measles cases occur in Ethiopia, South Sudan and Kenya, respectively [7–9]. Millions of individuals still don’t protected by the vaccine regardless of many effort done by gov’t [10, 11]. In many developing countries because of poor measles immunization coverage outbreaks of the disease are common and it puts enduring infirmities such as brain impairment, blindness, and deafness [10–12]. It is also responsible for 5% of the overall mortality from diseases which can be potentially prevented by vaccine . A baseline survey in selected zones of Ethiopia shows that valid vaccination coverage for measles was 50% and timely valid dose provided before the age of 12 months for measles was found to be 39% . There are different factors associated with immunization coverage in the Africa as well as in Ethiopia among those factors access to the immunization services, caregivers awareness, time of vaccination not known and long distance to reach institutions, maternal level of education, exposure to media, and antenatal care service utilization, geographic variations, and socio-cultural beliefs coupled with the timing of the measles vaccine as well as the fragile health service infrastructure [13–18]. Studies also evidenced inadequate immunization for measles will greatly affect the health of children [15, 19]. The Bassona Worena Woreda vaccination coverage not achieve the WHO targets of 80% immunization coverage by 2015. Therefore, this study was used to determine measles case, immunization coverage and its determinant factors between 12 and 23 months child in Bassona Worena Woreda, North Shoa Zone, Ethiopia. The study was conducted in the Bassona Worena which is one of 24 Woredas in North Shoa zone, Amhara region. Bassona Worena Woreda is located in Northern part of Addis Ababa at 130 km distance. The main ethnic group is Amhara in 2017, an estimated population of children’s under 2 years old was 7520. The study was conducted from April 1–30, 2018. The community based mixed cross sectional study design was conducted. All 12–23 months old children living in the selected clusters in the Bassona Worena Woreda. Z: the Z-score at 95% confidence interval which is 1.96. DEFF: the design effect of 2.
d: the tolerable margin of error which is 5%. By adding 10% (54) nonresponse rate the total sample become 598. The sample size was calculated based on the WHO 30 cluster based survey method. There were 4 clusters (Keyit, Goshbado, Gift and Bereager) in Bassona Worena woreda. In the woreda there were a total 31 kebeles that comprise 104 ketena. A total of 30 ketenas were selected by using simple random sampling technique from each cluster kebeles. Households in each ketenas were selected, through random selection (Fig. 1). A 12‒23 months old child who received one dose of measles . A 12‒23 Months old child who did not receive any dose measles vaccines . A confirmed measles outbreak, is defined as the occurrence of three or more confirmed measles cases . An interview based structured questionnaire was developed after revising previous studies [5, 15]. Six data collector and two supervisors were trained about the data collection way. The questionnaire was first prepared in English language then it translated to Amharic language and guide translated back to English to check the effectiveness questionnaire. The different groups were selected purposively for focus group discussion. Five focus group discussions, two with health professionals working in EPI unit and three with women with children conducted and then information saturation obtained. The English language questionnaire was translated into Amharic language to check the consistency of the tool. The data collection tool was pre tested on 42 households in one randomly selected kebele which is not included in the study. Training was given for data collectors and supervisors. Finally, the data collectors checked the completeness of the questionnaire at the end each day of data collection (Additional file 1). Finally, data checked, coded and entered into Epi data software. SPSS version 20 was used to analyze the collected data. The data described by computing frequency, tables, graph and statistical summaries. Variables showed statistical significance during bivariate analysis at P-value < 0.20 were entered to multivariable logistic regression. Adjusted odds ratios (AOR) with 95% CI, were estimated to assess the strength of associations and statistical significance was declared at P-value < 0.05. The qualitative data was analyzed by employing thematic analysis. The main ideas of the discussion extracted from audio record and written data and it grouped under each items of discussion guide. After the main ideas become organized, thematic areas developed, then ideas categorized under each thematic areas and it coded. The result of the qualitative part presented and discussed by triangulating with the quantitative part. A total of 575 women interviewed; making response rate of 96.2%. About 80% of the participants were rural resident. About, 259 (45.0%) were in the age group of 20–29 years, the median age was 30 years with IQR of 9 years. Majority 506 (88.0%) of the respondents were Orthodox and 79.3% of them were Amhara in ethnicity. Around 75.0% of respondents are married and most of them (57.3%) of them had monthly income of above 1000 Birr and (37.0%) of respondents were illiterate (Table 1). From the total, 312 (54.3%) did not attend ANC during their last child birth. Among respondents who attend ANC only 37.3% of them attend once. The majority 510 (88.7%) of respondents did not know any child with abscess after immunization (Table 2). According to this study, 458 (79.7%) of respondents explained that there was a health facility that provide measles immunization and health post were the frequently 315 (54.7%) reported health facility. Two hundred thirty-three (41.0%) of respondents said 15–30 min required to reach the health facility. Majority of them (71.0%) said the quality of the services provided was good (Additional file 2: Table S1). FGD participants indicated the availability of adequate number of health institutions providing measles immunizations services in the woreda. During the discussion, all FGD participants agreed as the quality of measles immunization service provided was good. From the total participants, 414 (72.0%) of the child are in the age group of 12–23 months and 51.3% of them were female. Most of them (61.0%) had less than 3 siblings (Additional file 3: Table S2). In this study, 439 (76.3%) of mothers ever heard about measles immunization. The main source of information was health professionals (47.7%). Two hundred forty-seven (43.0%) of the respondents said that the objective of immunization was to prevent measles. Two hundred twenty-four (39.0%) of respondents measles immunization given at 9 months (Additional file 4: Table S3). It was found that none of the respondents reported the measles symptoms seen in the child in the past 2 months. According to this study, 71.3% of child receives measles immunization and most (51.0%) of them receive in health posts, 19.3% at health centers and 1.0% at hospital (Additional file 5: Figure S1). Approximately thirty percent of participants explained why not immunized their children that I do not know about vaccine was the most common reason (Additional file 6: Figure S2). In multi-variate logistic regression analysis only age of mothers, use of ANC service awareness and health facility availability were the factors that significantly associated with measles immunization. Age group of 40 and above (AOR = 1.9; 95% CI 1.12, 5.83), awareness about measles immunization (AOR = 2.8; 95% CI 1.67, 9.34), ANC use (AOR = 3.67; 95% CI 1.96, 6.78) and health facility availability (AOR = 1.49; 95% CI 1.06, 8.12) were the independent predictors of measles immunization (Additional file 7: Table S4). This study was conducted to determine measles immunization coverage and its associated factors among 12–23 months children. The measles immunization coverage in this study was 71.3% which is comparatively smaller than studies done in Lay Armachiho District North Gondar Zone (77%) and Malawi (95.0%) [15, 20]. This discrepancy might be due to socio-cultural variation among those countries. In this study, mothers in who were 40 years and above were 2 times more likely than other age groups. This finding was consistent with a Bangladesh study . The main reasons for not immunizing child in this study were lack of awareness about immunization and no faith in immunization. During the FGD with HCW the existence of inadequate scientific knowledge about measles in some women was mentioned. This finding was similar to study conducted in Somalia. But study conducted in Congo found lack knowledge was the main reason reported by mothers who did not immunize their child for measles . Mothers who were aware of measles immunization importance were 2.8 times more likely to immunize their childhan children of mothers who had poor knowledge on measles vaccine. This finding was similar with studies conducted in different areas [22–25]. This result supported by the findings of the qualitative parts of the study during the FGD with HCW the existence of inadequate scientific knowledge about measles in some women was mentioned. Based on this study, mothers who had utilized ANC during the pregnancy were 3.67 times more likely to immunize their children than mothers who have not utilized. This result is supported by the qualitative part of the study. This finding was aligned with studies done in Amibara district and North Indian founds [26, 27]. According to this study, mothers who said health facility are available were 1.49 times more likely to be measles vaccinated than those who said unavailable of health facility. This finding was consistented with study in Amibara District . This finding was supported by qualitative part of this study. Similar to current study findings in an affluent community in the United States of America identified fear of side effects as an important factor for low coverage of immunization when they conducted [28, 29]. In this study, the coverage of measles immunization is low. Age of mother, awareness about measles immunization, ANC service use and health facility availability were the factors that significantly associated with measles immunization. The main reasons for not using the immunization services were lack of knowledge about immunization, no faith on immunization, fear of side effects and far place of the service. Therefore health education on measles should be given for community and mothers and other additional measures should be done. The study design was mixed cross sectional study method. It was useful to dig out the most important factors that affect the measles immunization coverage. The use of cross-sectional study design couldn’t formulate a temporal relationships between cause and effect. AMA wrote the research, developed the questionnaire, analyzed the data and wrote the paper and interpreting of the findings as well as joining on preparing the manuscript. AD and TM supervised the data collection, contributed to interpreting the findings, trained data collectors, and joined on preparing the manuscript. All authors read and approved the final manuscript. The authors would like to thank Debre Birhan University of financial support and Amhara Regional Health Bureau for providing sponsoring ship. Health science colleges, Health science colleges’ Instructors and all study participants are thanked for their cooperation during sample collection. All data were presented in the manuscript. Ethical clearance obtained from Debre Berhan University College of Health Science Department of public health. Official letters received from the department of public health and submitted to North Shoa Zone health office basso district and 7 kebeles’ administrator. The purposes of the study explained to participants and informed oral consent obtained. This was approved by research committee of the university. Respondents had right to respond or refuse to interview. All the information given by respondents used for research purposes only and confidentiality and privacy kept by omitting the name of the respondents during data collection procedure. 13104_2019_4104_MOESM1_ESM.docx Additional file 1. English version questionnaire for measles. 13104_2019_4104_MOESM2_ESM.docx Additional file 2: Table S1. Institutional related factorof respondents, Bassona worena woreda, North Shoa zone, Ethiopia 2017 (n = 575). 13104_2019_4104_MOESM3_ESM.docx Additional file 3: Table S2. Child related factor of respondents, Bassona worena woreda, North Shoa zone, Ethiopia 2017 (n = 575). 13104_2019_4104_MOESM4_ESM.docx Additional file 4: Table S3. 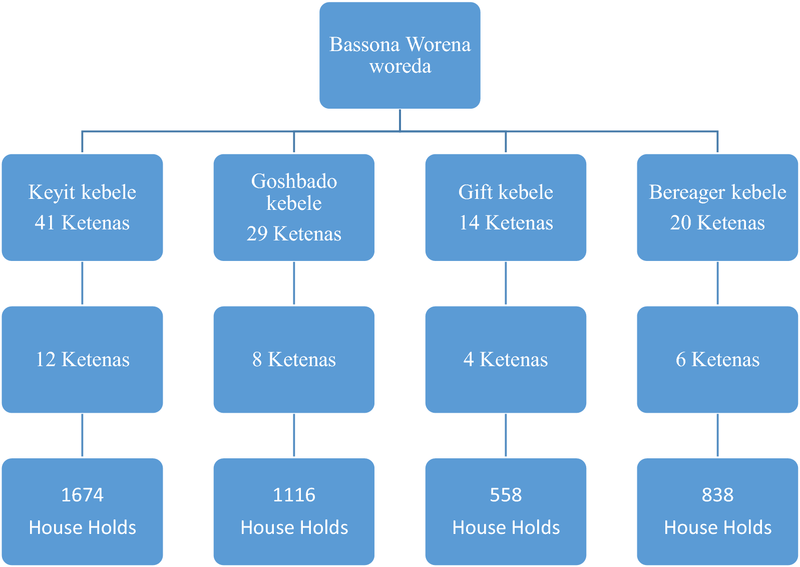 The knowledge of respondents, Bassona worena woreda, Ethiopia 2017 (n = 575). 13104_2019_4104_MOESM5_ESM.docx Additional file 5: Figure S1. Measles immunization among 12 to 23 months old child, Bassona Worena woreda, Ethiopia, 2017. 13104_2019_4104_MOESM6_ESM.docx Additional file 6: Figure S2. Reasons for not immunizing child among respondents, Bassona Worena woreda, Ethiopia, 2017. 13104_2019_4104_MOESM7_ESM.docx Additional file 7: Table S4. Binary logistic regression analysis of factors associated with measles immunization, Bassona worena woreda, Ethiopia 2017 (n = 575). WHO. Sixteen states of the world’s vaccines and immunization, 3rd edition. http://www.hqlibdoc.who.int/publication/2009/9789241563864_eng.pdf-windows.intel. Minetti A. Lessons and challenges for measles control from unexpected large outbreak. Malawi Emerg Infect Dis. 2013;19:2. www.cdc.gov/eid. Moss WJ. Measles still has a devastating impact in unvaccinated populations. PLoS Med. 2007;4(1):24. http://www.plosmedicine.org. WHO. State of the world’s vaccines and immunization. http://www.hqlibdoc.who.int/publication/2009/9789241563864_eng.pdf. Mebrahtom S, Birhane Y. Magnitude and determinants of childhood vaccination among pastoral community in Amibara District, Afar Regional State, Ethiopia. Res J Med Sci Public Health. 2013;1(3):22–35. http://scitecpub.com/Journals.php.